Welcome Hunters to Old Post Duck Lodge! At the end of Gentry West Lane sits Old Post Lodge. Built upon high ground with a serene view that will remind you of centuries past with towering Cypress and Tupelo trees dominating the horizon. Our spacious lodge gives you a retreat atmosphere where you can relax between hunts. Whether you're looking for an exciting duck hunting adventure or just a place to relax & retreat...you will not be disappointed! Old Post Lodge is operated by Old Post Outfitters. 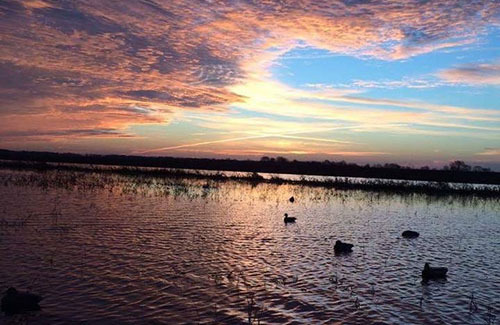 Arkansas is home to some of the world's best Duck Hunting. Every year, millions of waterfowl migrate down the famous Mississippi flyway on their journey south. Old Post Lodge is positioned in the midst of this migratory channel to give you a truly thrilling hunting experience. Old Post Lodge property is bordered by Dismal Swamp and provides excellent hunting among the green timber. Pit blinds are provided in field settings surrounded by giant Cypress & Tupelo trees. Rice field hunting and reservoir hunts are available on our other properties as well! Commercial hunting began in 2013. We also own & operate Menard Mfg. Company located in De Witt, AR where we manufacture Sportsman, Agricultural, Recreational & Industrial products. A few of our Sportsman products include: Blinds, Pirogue Boats, Utility Trailers, Grills, Smokers & Fish Cookers. Ask our Staff for information about our product line or visit www.menardproducts.com. Book your Reservation & Hunt today!